This year I hadn't really given any thought to what I'd like for Christmas, mainly because I've been so busy at work. The only thing I have really been after is a new camera as Eliot damaged the shutter on my current one. But as I've been shopping for others online or in the shops there have been a few things that have caught my eye and I have added a few more things to my Christmas List. Top Left: I love ankle boots in the the winter, especially under trousers or jeans. These lovelies are from Jones The Bootmaker﻿ on sale at the moment for £69.00. I love the zip detail and the small heel. I can't cope with high heeled footwear these days but these still have a bit of a heel for a bit of extra height. I think they look great for a day to evening look too! 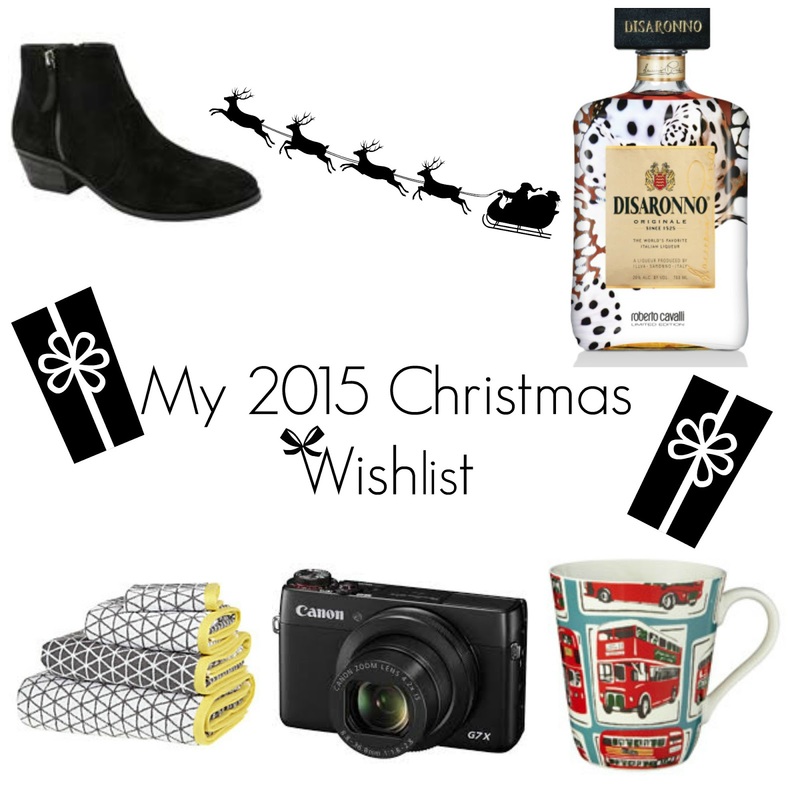 Top Right: Who doesn't have a favourite festive tipple, right? I'm not much of a drinker these days but it's nice to relax with a couple of drinks over the festive season. I'm a big fan of amaretto sours but I'm also happy with an amaretto and diet coke. This special edition Disaronno is 'dressed' in Robert Cavali too for a bit of a twist. Bottom Left: We are desperate to get new bathrooms in the new year and with that I think we need some new towels. This isometric design from John Lewis really caught my eye, I love the colours and think they would look great in the type of bathroom we are planning. Bottom Centre: As I mentioned I'm in need of a new camera and my heart is set on the Canon G7X. I really want to get back in to vlogging and I know this is a favourite amongst vloggers. I've heard it's not too great with photographs but that hasn't put me off! Bottom Right: I have loved Cath Kidston products for years, the first mug I had was bought as a gift I dropped it on the floor a year or two later which upset me! I currently have a 'flowery' mug that I drink my morning coffee out of at the moment but I wouldn't mind this red bus edition to my mug cupboard. I bought Eliot a bag in this print so he would probably think it was for him. So there we have it, a range of bits and bobs I would love to find under the Christmas tree this year! I'm linking up with Blogging Mummy's Anything Goes linky.